The Actionistas help business owners and entrepreneurs drive their businesses into top gear. We know this is easier said than done and so have created a centre of resources and help for you to take action. Whether you are starting out, revving up, going all out, or struggling to stay afloat we want to help you and share your journey. We turn the complex into simple and are problem solvers, that means we can find ways to overcome all those challenges holding you back right now! Have loads of ideas and energy but struggle to get them out into a plan and working for you? Have lots in your head and are in a good place but feel defeated and diminished if someone challenges your ideas? Have loads of ideas and ‘light bulb’ moments but never seem to get anything off the ground? Know you need to start but need some clarity and direction? Have loads of questions and want clear actionable answers but struggle to get them? You want the steps not the theory? Feel frustrated, stressed, lonely and think no one understands you? Feel like you might be coming to the end of your tether? Working part time or full time but dreaming of your own business – but everything you read seems to be aimed at £million enterprises and dreams and you just want a bit more cash each month to test the water? Don’t want to get into debt but almost all business plans seem to call for massive investment and you are seeking a better way to start? If you have answered yes to any of the above, you are in the right place to get all the help you need. All of us go through these wobbles and worries when running a business and there are lots of challenges at every stage. We can help. We have faced them all and got through to the other side so it’s time to help you. It’s tough and can feel like you are the only one ever to experience business challenges and hurdles. This is not the case, but it often feels this way. 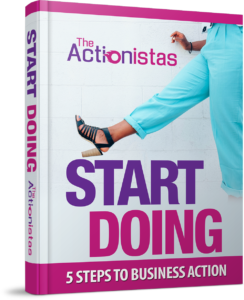 At The Actionistas you mix with other business owners who help you get perspective, share ideas and access expert, specialist help to move you and your business forward. Fun, practical, easy to understand help to support you in the roller coaster ride that is business life. No BS stuff just tried and tested stuff we have used in our own business and know works. ActionKnowHow this is our flagship monthly membership club which launches on the 10th May 2019 which provides programmes, content and resources to make your business fly. See more here. Step By Step Programmes – Actionista Focus these focus on specific areas we all need in business, from selling via Facebook Ads, business owners’ mind set through to sales and pricing help. Covering areas such as social marketing, pricing, market positioning, LinkedIn lead generation, taking on staff, legal stuff and more. Sign up for the details here. Podcasts – these are interviews and features with inspirational business owners and leaders to inspire you. Listen in here. The Actionista difference – we (Toni and Sue) have built businesses ourselves and got through many of the problems and hurdles there are – marketing, sales, staff, cash flow and clients’ demands and expectations. We have been doing this together for just on 30 years! With us, it’s all about practicality and putting the steps in place so stuff happens, and we know what it all looks like behind the scenes. We know what gets in the way, how it feels and how having someone by your side ensures you don’t suffer when everything is happening at once. We have your back and help you improve, personally and in business. We have done it – we don’t just talk about it. We have built businesses and gone through all the pain and the learning curves to now bring that practical help to you. We understand what it feels like to be distracted by having too much to do and how fast all the business stuff changes. We know what falling in and out of love with your core business feels like and can support you through challenges you face.